When you are on the low iodine diet, you have to take your snacks where you can get them, and this recipe is the place to go. Although even if you’re not on a low iodine diet, you are not going to want to miss out on these beauties. The low iodine diet is such a minefield, I’m sure I inadvertently ate a few things I shouldn’t. With salt, dairy, seafood, whole eggs and even some fruit and veggies off the menu, I had to get creative. I remember we had an afternoon tea at work one day and praise be to Katie who brought these apricots, because otherwise I would have gone very hungry! Now on the low iodine diet fresh fruit is always preferable to dried, but you know what they say, everything in moderation. I like to use Lindt Excellence Orange Chocolate but if you’re on a low iodine diet choose the darkest chocolate with the lowest milk content. If you’re not on the low iodine diet, anything goes! I like the orange variety because the chocolate, apricot, orange flavour is a taste trifecta and the nuts in the chocolate complement the pistachios for some value added crunch. I’ve updated the recipe since my low iodine days. Katie’s original version covered the whole apricot in chocolate (which is very well and good) but I loved the half and half combo with the apricot peeking out of it’s chocolate blanket and felt compelled to add some nuts. 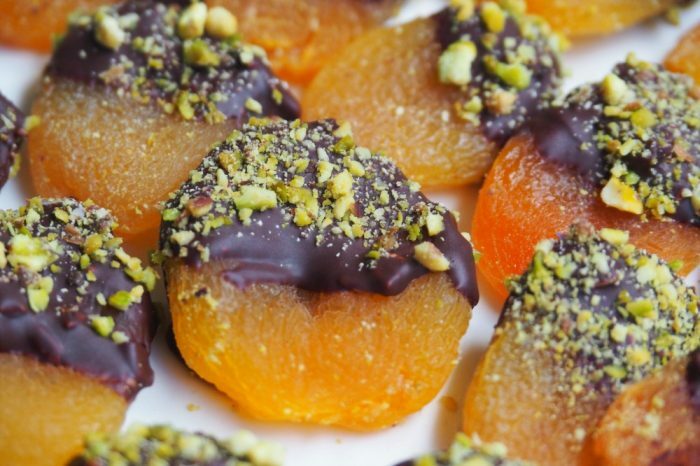 Of course, if you want a nut free version, just skip the pistachios and if you want an all chocolate version, go the whole hog and dip all the apricot in! The best bit about these apricots is that they don’t take much time to prepare or to set, in fact, this recipe is so quick and easy, it’s the snack version of instant gratification. Patience never has been my strong point. Sigh! Are you a patient person? What did/would you miss most on the low iodine diet? Using a rolling pin, flatten the apricots between two sheets of baking paper until they are flattish discs. Break the chocolate into chunks and melt in the microwave on 30 second bursts, stirring each time, until completely melted. 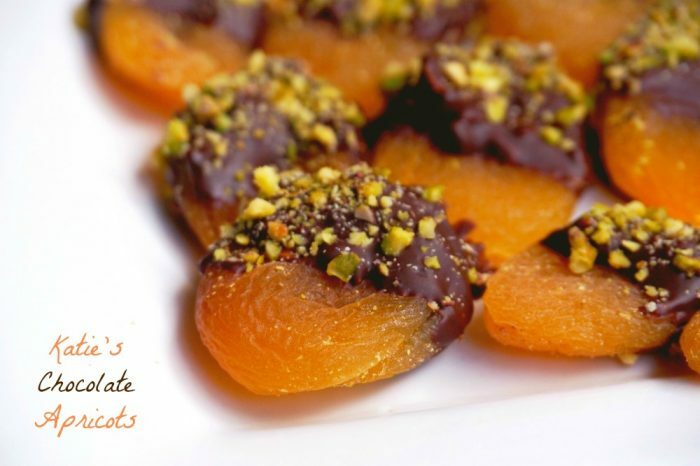 Dip half of each apricot in the chocolate, and then sprinkle the chopped nuts on both sides while you are still holding it. Lay the choc nut covered apricot on the prepared tray. 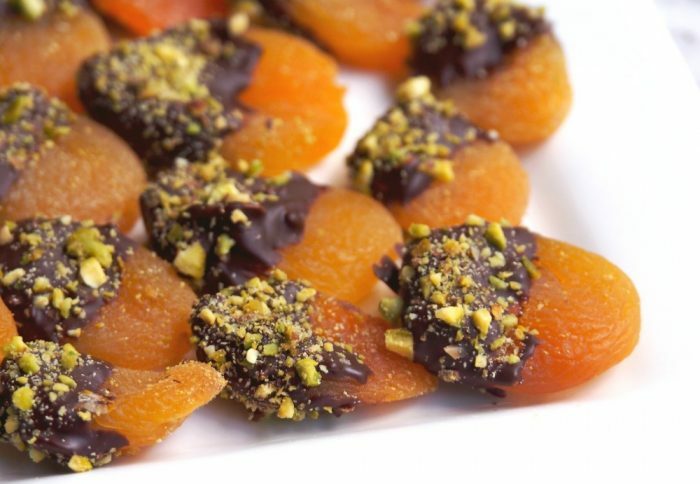 When all the apricots are dipped and sprinkled, refrigerate on the tray for 20 minutes until chocolate has hardened. TIP! If you use dairy free chocolate, the recipe will be dairy free too! The apricots will keep in the fridge for 2-3 days.